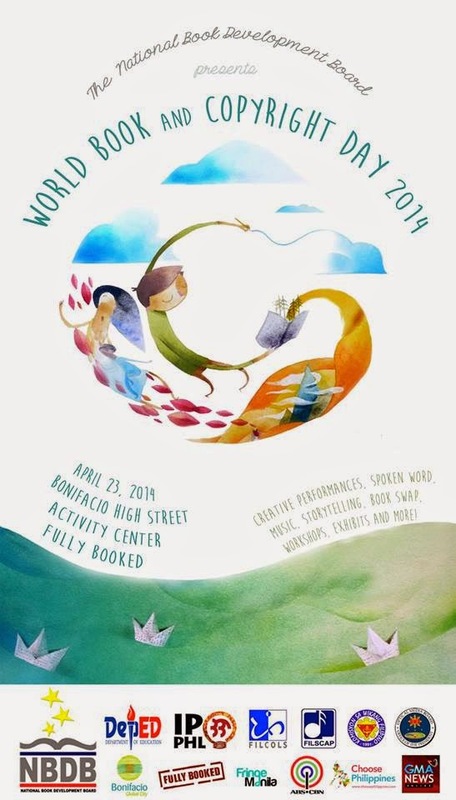 Everyone is invited to this year’s World Book and Copyright Day celebration on April 23, 2014 at Bonifacio High Street Activity Center and Fully Booked in Taguig City. This is a day to celebrate the power of the written word and the excellence of our homegrown talents in music, literature, visual arts, dance, theater and more. Opening Ceremony begins at 10:00am. Activities are spread out until 8:30pm. 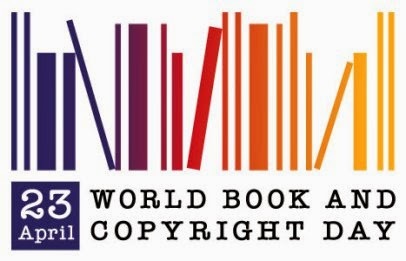 World Book & Copyright Day is an annual event promoting reading, publishing, and copyright awareness. 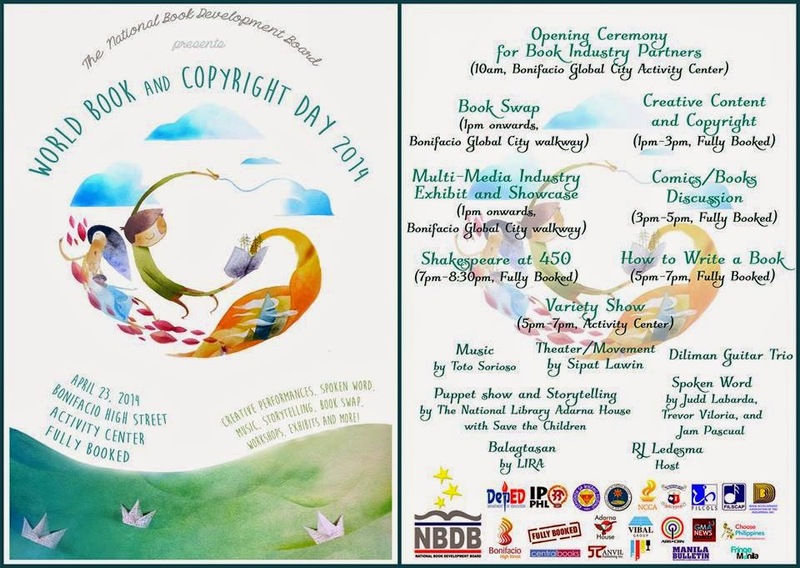 This year, the National Book Development Board is celebrating #WBCD2014 at Bonifacio High Street, Taguig City with an industry fair of creative performances, musical acts, exhibitions, workshops, seminars, etc. For 18 years, UNESCO has been celebrating World Book and Copyright Day, a day to celebrate the power of the written word and reflect on the diversity and changes in our books over time. NBDB Chair Flor Marie Sta. Romana-Cruz will deliver a State of the Book Industry Address. A variety show will be held with performances by the Diliman Guitar Trio, Sipat Lawin Ensemble, slam poets like Judd Labarda, Trevor William Viloria, and Jam Pascual, the Balagstars Balagtasan group from Linangan sa Imahen, Retorika, at Anyo (LIRA), and comedian RJ Ledesma. There will be a multimedia exhibit and showcase featuring several local publishers and a book swap sponsored by ReaderCon at the BHS Walkway. Workshops and seminars on topics from Shakespeare to comic books will be held at Fully Booked. For more details on the program of events, check here. RSVP here.